Author of this site and manager of Mallee Native Plants Nursery. Provided by her husband, Trevor Hampel. Corinne joined the Australian Plant Society (when it was SGAP) in 1976 when she lived in Port Augusta, South Australia. She was inspired by her doctor and close friend, as well as her brother-in-law and his plantings on the family farm in the Murray Mallee. She began propagating plants for her garden in a small way. Her passion for our native plants was further encouraged by two trips to Western Australia in the late 1970s. 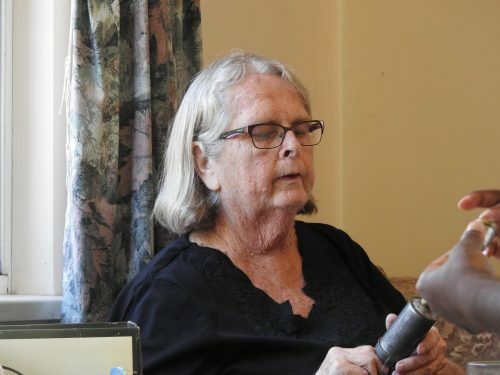 With the move to Murray Bridge in 1983, she began propagating plants in earnest, especially with planting up their newly acquired five-acre block. Over the next few years, this passion developed into the establishment of her Mallee Native Plants Nursery. This resulted in a keen involvement in the Adelaide plant sales which she always enjoyed. She also took plants to the annual plant sale at Geranium run by the Parrakie Group. Both Corinne and her husband Trevor were active members of the Murray Bridge APS Group (now defunct), both of them serving terms as the group’s president. They also willingly helped in the annual Flower Show in the local town hall and organised by the local group. Both Corinne and Trevor were guest speakers on plants and birds for local clubs and service groups. This was their way of sharing another passion of theirs: photography. For some years Corinne also shared her flower photos and her passion for plants on her website. Her love of the natural environment saw her enjoying many wanderings along bush tracks, through national parks and botanic gardens in many parts of Australia, and especially private gardens. This was always undertaken with camera and notebook in hand, and secateurs for taking cuttings when visiting private collections. 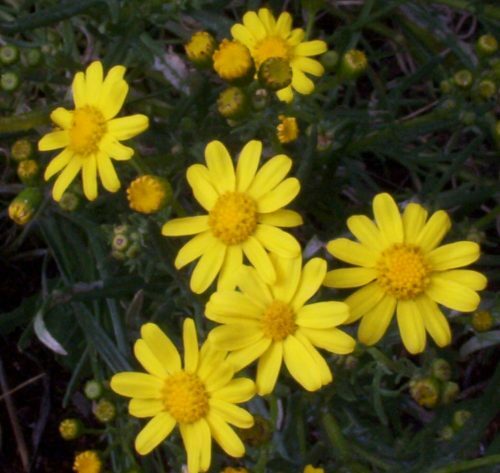 She was particularly interested in our native daisies and was an active member of the Daisy Study Group. She was also an active member of the Correa Study Group, with correas being another favourite plant. Apart from her love of plants, her other interests included a dedication to helping others through the life of her church, including leading Bible studies. She was gifted at catering for large church and community groups. She was a passionate and dedicated teacher, especially in teaching ESL learners, including recently arrived adults from overseas. She privately tutored a large number of struggling students over many years. She was a creative person with many interests in the crafts, including sewing, patchwork quilting, pottery and spinning and weaving. She was involved for a time in the local Hand Spinners and Weavers group, and was treasurer of the local Patchwork Quilters group until a few days before her death. In the last 8 years, much of her energy was directed towards spending time with her two grandchildren. They adored their Nanna and she shared many times of laughter and games with them; they were the delight of her life. Corinne has always had a struggle dealing with her health issues. In her final years, this meant that her ability to maintain the nursery was slowly diminished, much to her disappointment. In the latter half of 2017, her health rapidly deteriorated and the cancer spread rapidly. Despite her often constant pain, she rarely complained and still had a positive outlook on life. She never lost interest in seeing a tree or bush in flower. There was a rapid deterioration in her condition in the last two days of her life and she passed peacefully from this life on the 21st January 2018 just shy of her 68th birthday. She was surrounded by her immediate family who miss her dearly. This site will remain open for the time being. I will maintain the site, adding the occasional post about Australian plants, flowers and their relationship with native birds. Comments will also remain open for the time being but I am generally unable to respond to questions. My knowledge of our plants and their propagation is somewhat limited, though I did learn more than most through many conversations with Corinne (and others) over the years. I also helped in her nursery from time to time. The nursery is no longer operating and there are no plants for sale. For more advice, please contact your local plant nursery, or the relevant branch of the Australian Plant Society in your state. Mallee tree in flower in Corinne’s garden about the time of her death. When I look at the date on the last post made on this blog I am horrified but that is how life is sometimes. I have had to desist growing the large numbers of plants I used to but I cannot resist plants that have cuttings on them so I am always having a go at something, just not on the scale I would like to do. 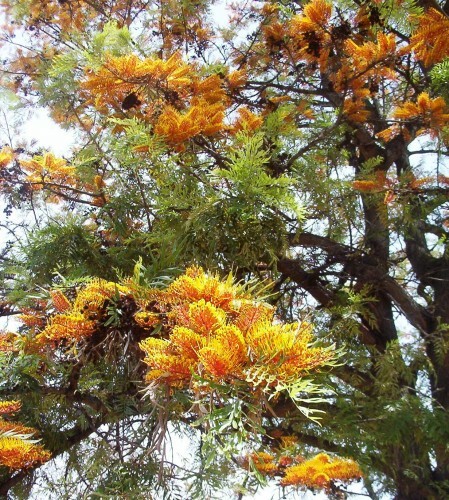 A friend asked me for photos of a couple of South Australian native plants and that set me thinking about what I might be able to do on the blog. There are a number of posts that need tidying where links have been broken over the years, and probably better photos in my collection now. 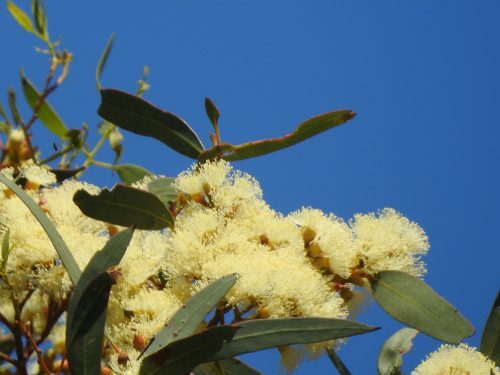 Spring is a great time to be stimulated to share the wonder of our amazing native plants as many begin to burst into flower in the next few months. 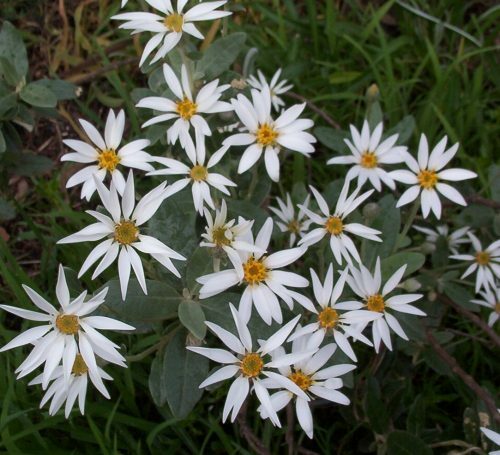 For further information Olearia pannosa. Photo by M Tranent. I hope to upload a photo of the garden mentioned. There are quite a few plants flowering in my district in May. They include Swainsona formosa, Acacia iteaphylla, Eremophila maculata forms, to name a few. This has stimulated me to begin again on my blog, as well as the queries for information that I periodically receive. My lifestyle has changed and should allow me to pick up again. Swainsona formosa may seem to be an unlikely plant to include in this list. 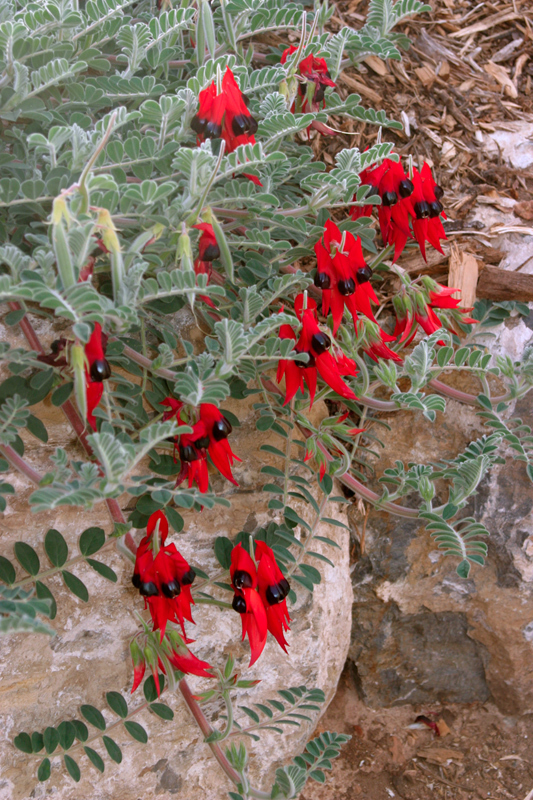 However a roughly 5square metres front yard of a house in the town has been sown completely to the Sturt’s Desert Pea. The owner described to me that he threw a handful of seed over the yellow gravel he had spread over the area which may have been lawn before. He did it at this time of the year relying on natural rainfall to germinate the seed. He applied some extra water during the height of summer to keep them going. 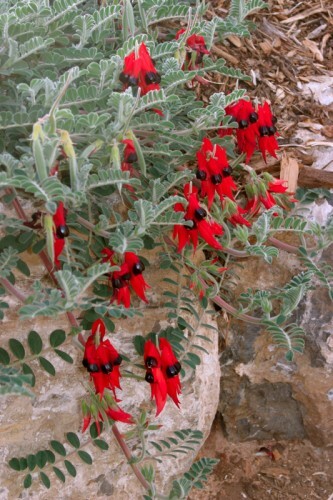 The result was a gorgeous display of red flowers with the black eye, against the grey green foliage. He showed me where more seed was germinating in some of the bare patches. He also had an abundance of seed pods filled with seed, a handful of which he generously gave to me.